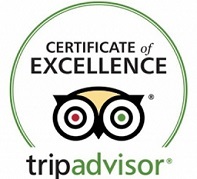 Tripadvisor certificate of excellence winner. Jim's Smokin' Que consistently earns great reviews from travelers across the nation. Only accommodations, attractions and restaurants who keep the standard are worthy of this award. Next time you're in the North Georgia mountains stop in and taste for yourself. You'll be glad you did. You can "Smell Our Butts For Miles"
Jim's Smokin' Que on The Weather Channel from Rich Porter on Vimeo.